What is the turn-around time on orders? How large is each Memory Glass™, including wooden base and the height and weight? How large is a Memory Glass™ Pendant? How much cremated remains are needed for a Memory Glass™... large or small? 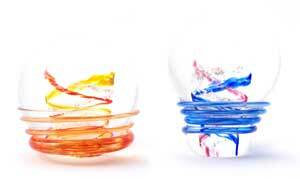 Are the cremated remains visible in the glass or used during the hand-blowing creation? How large is the vial and scoop you send for the cremated remains? Is there a place on the Memory Glass™ where a name or date can be etched in? Is the stand necessary for the Memory Glass™ to sit upright? Are the two connected? How is a Memory Glass™ made? How do we know our loved one's remains are safe? Who actually makes the Memory Glass™? What is a footing? What is the difference between a flat and a raised footing? What is the difference between the stands? Can a Memory Glass be made from hair? What shipping methods are used? What are the prices for shipping? You then ship us a half of a teaspoon for each Memory Glass or pendant ordered in the vials that we will provide you with in advance. How Large is a Memory Glass Pendant? A Memory Glass Pendant is roughly the size of a quarter and is about 1/4" inch thick. Of course each pendant is unique and may be a bit larger or smaller. Both the large and small Memory Glass™ require ONE scoop (1/2 tsp) per piece. For instance, if you order three, include three scoops. Any unused remains will be shipped back to you with your final order. Yes. The streaks of white that you see in all of the pictures are actual remains. 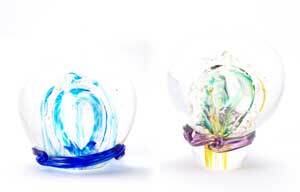 They are infused within the layers of glass that create a Memory Glass™. The vial that we use is roughly 1.5 inches in diameter and 2.5 inches tall. The scoop is roughly 1/4 teaspoon and provides enough for ONE Memory Glass™. Yes. The bottom of the Memory Glass™ is a flat polished surface. There is just about enough room for initals and a date. To fit more text, such as a personalized message, or a full name and date, we recommend adding a Mahogany stand with an engraved plaque. No. Memory Glass™ will stand by itself without the wooden stand. The stand is not connected to the Memory Glass™, but provides white LED light from below and a place for a personalized plaque. Light Emitting Diodes. Found in key-chain flashlights, and new car head-lamps, they provide pure white light for 100,000+ hours and run on minimal electricity, while emitting little to no heat. 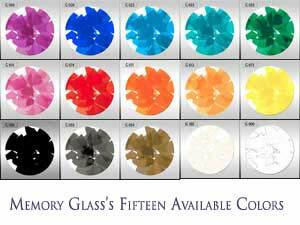 The process of creating your Memory Glass™ is quite simple. We send you a welcome kit that provides everything you need to ship a portion of the remains back to us. Once we receive the cremains, we begin to create your Memory Glass™. With the color & design options labeled on the vial, we lay out the remains and colored glass in patterns and infuse them between the second and third layers or "gathers" of glass. After the fourth gather, the piece is ready for final shaping and the adding of an optional footing or wrap. The wrap goes on HOT and is fused to the outside of the piece, becoming one with the Memory Glass™. At this point, the Memory Glass™ is still attached to the "blow pipe" and must be broken off. This leaves an uneven, sharp edge that is polished away completely after the piece fully cools a few days later. All Memory Glass™ orders are tracked from the time that they leave your hands at the post office, until the time that the final piece returns to you. USPS Express Priority shipping is the only legal method for shipping cremated remains. USPS provides shipment tracking, and the vial label provides order tracking on our end. Records of each order are kept in our company database and accompany each order during the entire creation process. Any unused cremains will be returned with your order in its original vial. The caution we will employ in this process will equal the care and consideration devoted to the entire procedure - from our first contact to the actual sculpting to the delivery of your keepsake - ensuring that you, your loved one, and the memorial in their honor are treated with the utmost respect. We make them ourselves, ie. Nick, Lucas, John and Justin make them all. We feel that the only way to truely make sure that nothing happens to your order is to blow them ourselves, in our own shop. This also has lowered the turnaround time to 2-4 weeks from the time we receive the welcome kit back from you. Can a Memory Glass be made from hair? We can make Memory Glass pieces using hair, but the hair will be "invisible". ie. it burns away. The "essence" of the hair is there, but there is nothing visible once it's finished. Memory Glass ships all cremated remains using USPS Express Priority Services. Federal Law requires that cremated remains be sent this way, and we attempt to adhere to these guidelines as strictly as possible. Shipping for pendant and touchstone orders are $20/order. Shipping for orbs and heart orders are $30/order.